As a teenager in the 1980s, I loved using computers, and also building things, and especially loved building things with computers. Naturally, I adored Music Construction Set and Pinball Construction Set. The version of Music Construction Set for the PC floating around in the wild was mine; it comes with 30+ tunes more than the original diskette had, mostly covers as I learned to use the program, or learned my music lessons, or transcribed tunes I heard on other computers (the “power bots” MCS tune should be familiar to Apple II owners). My Pinball Construction Set tables were not as enjoyable, so they stayed with me. The more I built my own tables, the more I wanted to see how other tables were built. 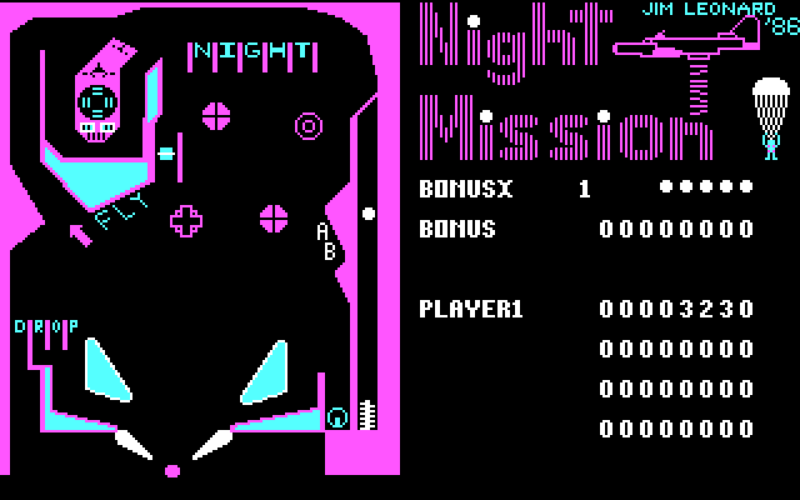 I acquired a copy of Night Mission Pinball from a friend, and played it for hours, jealous of how much more it did than PCS: Sound was more “authentic”, more complicated scoring, better graphics. I ended up playing it exclusively and stopped using PCS. Unfortunately, I played it so much that the disk wore out and wouldn’t boot any more. Worse, my friend no longer had a copy to make for me, and I was too broke to buy it proper. What to do? 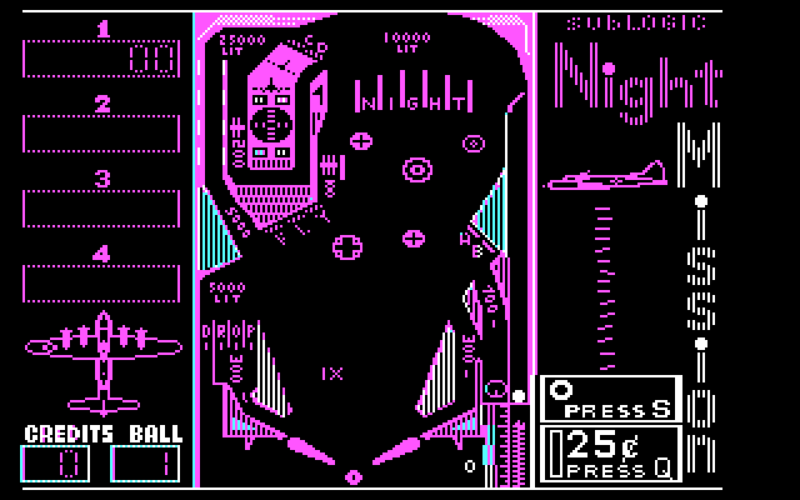 If you’d like to play the amateur horror that is Jim Leonard’s Night Mission Pinball, you can now do so. The 1980s was defined by trends, one of which was the rise of the classic horror movie. This manifested itself in the form of several “horror” TV shows that combined elements of The Twilight Zone (including a Twilight Zone remake itself! ), A Nightmare On Elm Street, and elements of traditional horror. These were sometimes hard shows to make, as they had to be sufficiently scary, disturbing, surprising, etc. while not violating any television broadcasting codes. Many episodes used humor to disarm some of the more unsettling themes. Due to the content, many of these shows were broadcast only in the late evening between midnight and 2am. Two of these horror anthologies, Tales from the Darkside and later Monsters, were produced by Laurel Entertainment, the brainchild of George Romero and Richard P. Rubinstein. Tales was pitched to networks based on the success of Laurel’s Creepshow, which WGN bought and syndicated. When it ended, Laurel started Monsters. Monsters is very much like Tales, except it focuses more on horror, whereas Tales delved into sci-fi, fantasy, and modern-day “ironic twist” stories similar to The Twilight Zone. Being the month of Halloween, there’s no better time to check out Monsters. It was recently released on DVD, and you can find the entire series online if you look hard enough. To help you experience only the good stuff and skip terrible episodes, I’ve created Trixter’s Totally Subjective and Spoiler-free Guide to Monsters (The TV Show). It’s presented as a Google Docs spreadsheet with some filters for your convenience. By “spoiler-free”, I mean I’ve created a column that describes the basic plot of the show without giving away anything that would ruin any surprises, twist endings, etc. If you want to only check out notable guest stars, there is a “notable guest stars” column. If you are only watching Monsters because you were a fan of Tales from the Darkside, there is a column for that too: Because both shows were created by the same production company and most of the same people, many Monsters episodes feel more like TFTD, so you can filter on that if you were only a fan of the former. But if you’re really short on time, just use the filter on the Grade column and watch anything graded A. Some of those are just bananas. In the world of vintage computing history and preservation, I am both an archivist and a conservator. There are very many archivists in various corners of our field; it is easy to gather up collections from multiple sources and dump them in a single place for the viewing public. Conservators, however, are the people who roll up their sleeves and get their hands dirty. They perform the task of extracting the archival works in the first place from the original distribution medium. This can range from reading files off of a disk, to reconstructing long-past systems using 3-D printed replacement parts, to figuring out the structure of unfamiliar data. Conservation is work. Our hobby needs more conservators. Some data rescues have high visibility, such as the recovery of Andy Warhol’s early digital art. But the majority of rescues are not notable. My specific area of focus is very early (think 1980s) PC games on floppy disks, and recently I’ve recovered a few items not yet found “in the wild”, but painfully boring: A horrible WWII flight combat sim, a chess tutor, a children’s A-B-C program. The latter is PCjr-specific, which is intriguing, but for the most part these items hold no significant place in history. Still, I do it for The Cause. One favorite example in recent memory was when I rescued a no-name taiwanese XT clone out of the trash (literally; it was in a dumpster). Based on the files left behind, the system was owned by an asian female college student in the late 1980s who was an accounting major and used the computer exclusively for school… or so it looked at first glance. Tucked away among all of the spreadsheets, essays, and databases, in a tiny corner of the filesystem, was a single directory that was filled with poetry, in a style written with few carefully and powerfully chosen words. The entire system and its files gave the impression of a young woman who was following her father’s wishes, but who longed for something more fulfilling. And it is here I will introduce you to miss Amanda Collins, who holds the record for the most endearing recovery I’ve had this decade. I don’t know anything about her other than her name, and I certainly don’t know which out of the nearly 1500 “Amanda Collins” located in the USA White Pages she is. I don’t know how old she is, although I have a good guess how old she was All I can tell you is how I found her. AND SAW E.T. HE REPLIED WHO ARE YOU. I REPLIED I AM AMANDA N. COLLINS. CREATRUER I SAID IT IS E.T WHAT? SAID BYE-BYE MARY SAID  OK GOOD BYE. EXPLAIN THIS  E.T.GET HIM OUT OF HERE. AHEAD BUT NOT NEXT TIME I'LL REMEMBER. This little girl had decided one day to write a story, and when the program prompted for a diskette to save it, she grabbed — with sticky jelly fingers — whatever diskette was closest and jammed it in… in this case, Daddy’s expensive business program, ruining it in the process, and possibly the drive it was jammed into. I lack the skill to convey how adorable I find this. In your own digital archaeology adventures, may you someday feast on cheese bergers, and see dinasores at the park.